Blue Frog Jeans was established in Amsterdam in 2016 with a mission statement to produce quality denimwear and clothing for the curvy girl. Their range includes regular, skinny and slim fit jeans that start at a size 14 for women. Their leather jackets look great paired with the jeans and provide a stylish accompaniment to any outfit. Style with trainers for a casual look or team with your favourite heels for evening. Shop Beige Plus’s full range of Blue Frog Jeans below. Whether you’re adding to your ever-growing jean collection or searching for that perfect pair, choose Blue Frog Jeans for fashion straight from Europe. The Blue Frog style is vintage inspired, custom made pieces that are accessible to all body shapes. Their products are made from the highest quality materials sourced locally in Amsterdam, so they can bring you exceptional, timeless clothing for your closet. 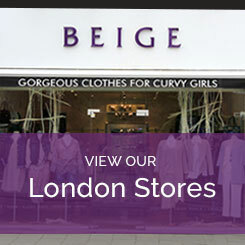 Browse the Blue Frog Jean range or get in touch with Beige Plus today on 020 8455 5888.